UC Campus News, a news aggregator that republished articles from student-run newspapers without permission or consistent author crediting from eight of the 10 UC campuses, announced in an email to the UCSD Guardian that they would be closing effective April 2, following inquiries from student editors. Every article that was published was done so under the author name “Campus Mojo,” and inconsistently listed where the pieces originated from at the bottom of the article with either a link to the original source and/or the author’s name. These credits were only given when the original source listed an author’s name at the bottom of the article, something that not every UC newspaper does. The owner of UC Campus News declined to identify themselves in a follow up email. While active, the website republished content from UC San Diego’s Guardian and Triton, UC Berkeley’s Daily Californian, UCLA’s Daily Bruin, UC Santa Barbara’s Daily Nexus, UC Irvine’s New University, UC Davis’s California Aggie, UC Riverside’s Highlander, and UC Santa Cruz’s City on a Hill Press. Over the course of Winter Quarter 2019, UC Campus News republished original content from the Guardian 15 separate times. Broken down, the website republished three opinion pieces, one news article, one feature, two lifestyle pieces, seven arts and entertainment pieces, and one sports article. Nowhere on the website is it acknowledged that all of the content is repackaged from various campus newspapers. UC Campus News also limited access to information on the amount of influence they had by disabling follower counts on its Facebook and Twitter pages. Many staffers from the organizations whose content had been republished by UC Campus News were unaware of the aggregator’s existence until the Guardian had reached out for comments. Caitlin Antonios, editor-in-chief of UC Irvine’s New University, said that while the articles republished from their organization did have links to the original source as well as author credits, they were never asked by the website to have their articles republished in the first place. Emily Stack, editor-in-chief of UC Davis’s California Aggie, told the Guardian that while their organization does allow some republication of their content, this only comes with expressed permission, the promise to credit those that worked on the piece of content, and a link back to the original site. Andreas Rauch, editor-in-chief of UC Riverside’s Highlander, said that his organization had not previously been aware of UC Campus News, but that he intended to contact the website soon and ask that their content be removed. 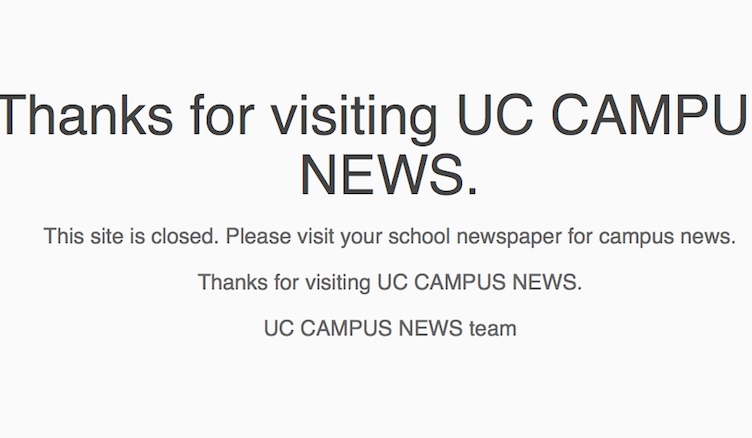 After the closure of the aggregator had been announced, the management of UC Campus News declined to comment any further. As of the time this article is being written, no legal action has been taken against the currently unknown owner of the website. pool complicated and relaxed together with your members of the family.